In November 2018, Google & Temasek updated their industry study stating that eCommerce in Southeast Asia (SEA) will be worth US$240 billion by the year 2025. The updated figures upped last year’s predictions by US$40 billion due to exponential development in online vacation rentals, online food delivery, subscription music and video on demand products. The study also predicts that the internet economy in SEA will reach the US$72 billion in gross merchandise value (GMV) mark by 2018. A big chunk of the valuation will be held by the eCommerce sector valued at approximately US$102 billion by 2025. But to reach that goal, the study also mentions that a bigger talent pool of internet economy professionals will be required to realize the industry’s full potential. As such, we conducted a study to analyze the eCommerce workforce and measure if SEA would be able to reach its US$240 billion potential with its current state of employment. 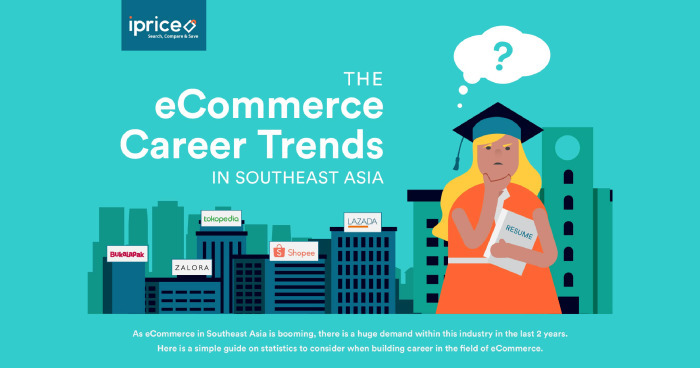 To derive our findings, we analyzed employee data and hiring trends of the biggest eCommerce players in Southeast Asia based on the Map of Ecommerce Q3 data. This study was conducted through LinkedIn and covers Thailand, Singapore, Malaysia, Indonesia, Vietnam, and the Philippines. 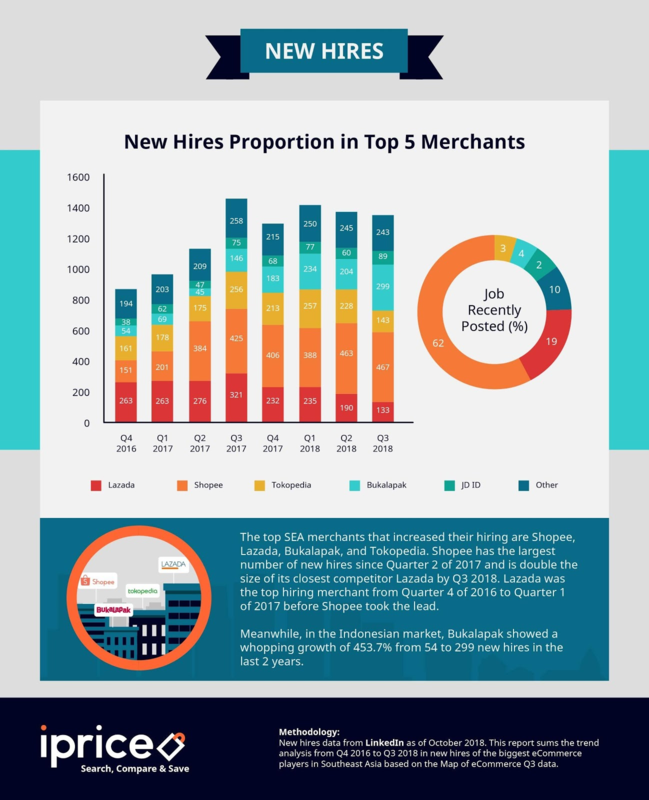 We analyzed the hiring trends of SEA’s top eCommerce players between and found that workforces of the largest players grew an average of 808 employees per quarter between Q4 2016 and Q3 2018. 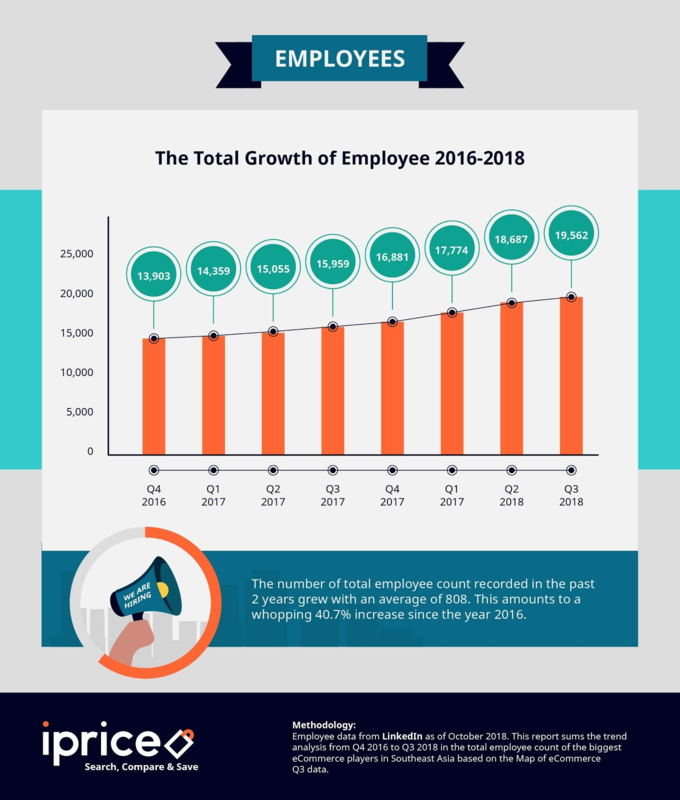 The growth rate in the eCommerce sector is much higher than the industry average which Google & Temasek predicts that the internet economy workforce needs to grow at 10 percent to reach its full potential. This is a positive sign because digital companies usually face difficulty when looking for suitable candidates. Supporting this claim is Shopee which saw its workforce grow 176 percent over 2 years from 1,384 to 3,831 employees by Q3 2018. Shopee’s growth means that it has been hiring an average of 3 people per day over the past 2 years. Shopee’s massive expansion took off when its parent company SEA (formally known as Garena) raised US$720 million between 2016 and 2018 and garnered an additional US$575 million after listing on the New York Stock Exchange (NYSE) in 2017. Its counterparts in eCommerce, such as Lazada, Tokopedia, Bukalapak, experienced growth in their workforces as well. Zalora is the one exception among the big players with a reduction from 1,859 to 1,715 employees. SEA’s big investment into Shopee was evident in its recent financial results when it reported a wider third-quarter loss on rising investments in its eCommerce unit. Nonetheless, the huge investment on Shopee is paying off as they overtook more experienced players in a short period of time to become Lazada’s closest competitor in the region. Shopee also showed no signs in slowing down in its hiring rate. Among all the job vacancies made available by the region’s eCommerce players, more than 62 percent of jobs were made available by Shopee. Following in second place was Lazada at 19 percent and Bukalapak at 4 percent. 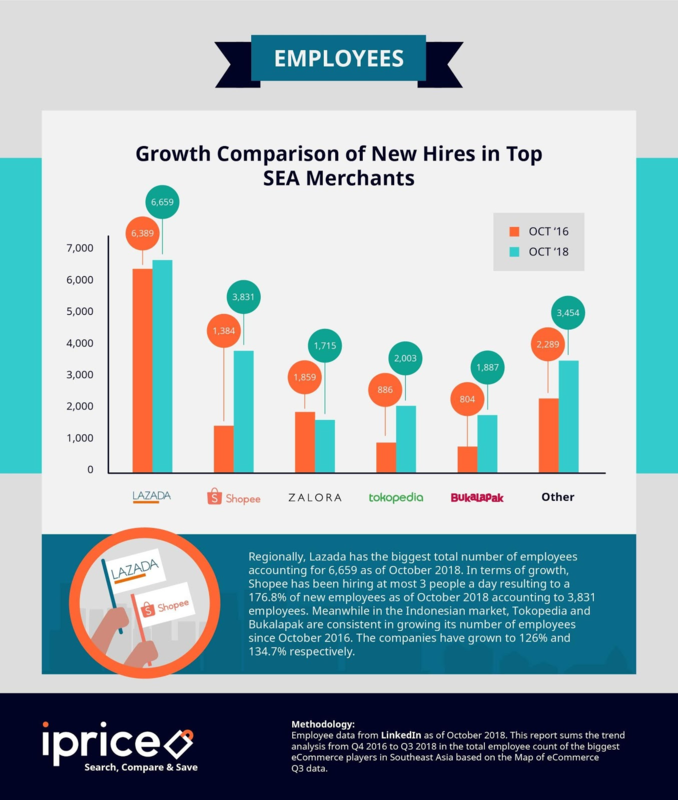 Though faced with much competition from Shopee, Lazada remained unfazed with the highest number of staffs at a total of 6,659 active employees in Southeast Asia. As an established player, Lazada still invests significantly in hiring new employees. 19 percent of job vacancies from the top eCommerce players in SEA derived from Lazada. 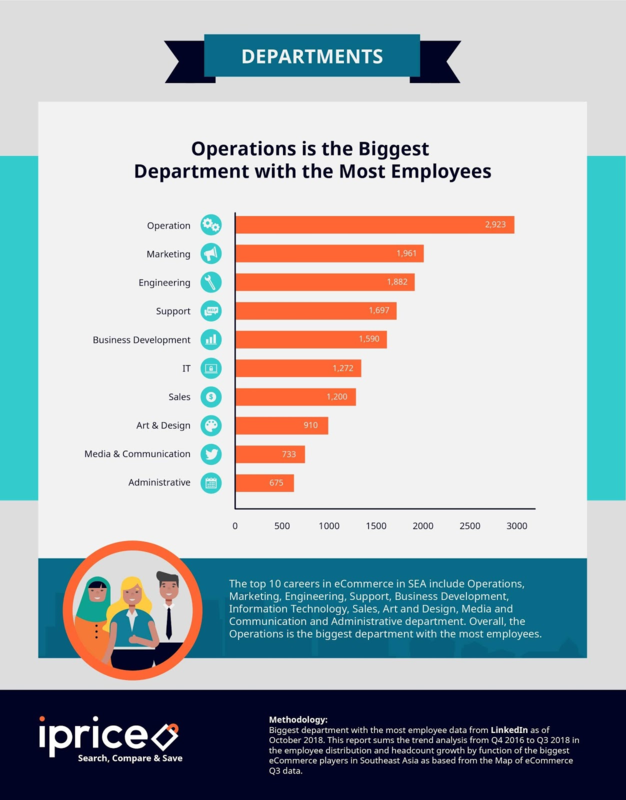 According to our study, departments with the highest number of employees are operations and marketing. Following in third and sixth place are the engineering and IT sector. According to a market study, the real challenge comes when employing highly-skilled professionals in functions such as software engineering, digital marketing, data science, and product marketing. Hiring people for these technical roles has been particularly challenging as the rapid growth of eCommerce meant that there was no prior supply for the digital workforce in previous years. The lack of talent for eCommerce specific expertise is a pressing issue and is identified as the most critical and unresolved challenge according to Google & Temasek. As such, it is common practice for eCommerce to recruit foreign talent with relevant experience and knowledge. However, this might not be the best long-term solution as most expatriates work on short contracts and only a handful of expats intend to stay more than five years in a developing country. The ideal solution is to invest in local talents who are more likely to commit to long-term careers. Mitigating this issue requires the participation of both recruiters and the upcoming workforce. A spokesperson from Facebook Indonesia stated that digital companies need to move away from the traditional hiring process to adopt a more effective style in hiring new employees. Resolving this issue would include rethinking interview processes and internal expectations to prioritize candidates who are self-motivated, and effective in problem and conflict resolution. This means putting lower importance on hard skills and industry-specific knowledge. Recruiters from the digital sector should invest their resources in training their workforce to mitigate the lack of technical skills and knowledge. Education institutions must address widespread issues such as job hopping, the lack of ownership and strategic thinking as well. A market researcher states that the most lacked skills are problem-solving, strategic thinking and teachability. This is a widespread issue as most fresh graduates in the region do not have working experience when entering the workforce. This is unlike North America, where youths are expected to hold part-time jobs, complete internships and gain relevant work experience before starting their tertiary education. Lastly, the upcoming generation should be made aware of the great potential of eCommerce in order to be inspired and motived to start a career in the digital arena. This requires the active involvement of both educators and eCommerce players through collaborative initiatives aimed to inspire and show what it takes to thrive in the digital economy.